The Promotion of Access to Information Act, No 2 of 2000 (”the Act”) was enacted on 3 February 2000, giving effect to the constitutional right of access to any information held by the State and any information that is held by another person and that is required for the exercise or protection of any rights. Where a request is made in terms of the Act, the body to whom the request is made is obliged to release the information, except where the Act expressly provides that the information may or must not be released. The Act sets out the requisite procedural issues attached to such request. Click here to download the Manual of Reunert as required in terms of the Act. This document provides a reference as to the records held and the procedures that need to be followed to request access to such records. 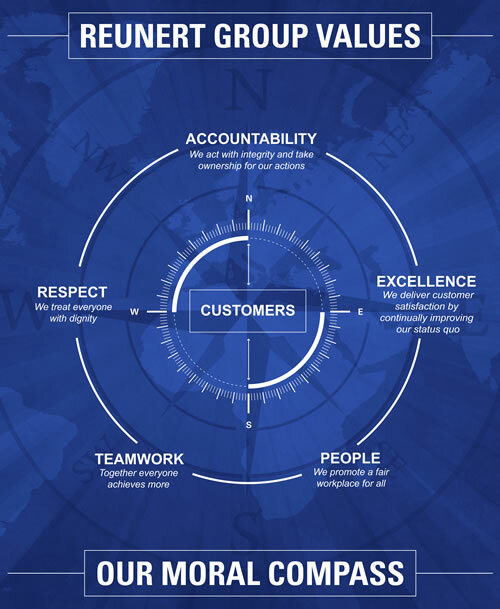 If you suspect any wrongdoing such as theft, bribery, anti-competitive behaviour, intimidation, corruption or fraud within Reunert or any of its companies please report it to the Deloitte Tip-off line. 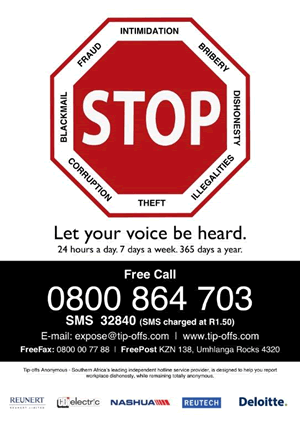 Tip-offs Anonymous is completely independent, confidential whistleblowing hotline service operating 24-hours a day, 365 days a year. All reports received are thoroughly investigated and acted on under the guidance of internal audit.